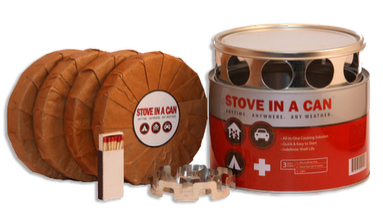 Stove in a Can is a great addition to anyone's food storage and camping supplies! In an emergency situation I think we can all agree that cooked food would be nice :) With camping this kit is easy to store and take along. I also love that its packaged in a way that would be easily stored in a 72 hour kit! AND there is no expiration date!! I LOVE to give emergency items as gifts (and I love to receive them :):)) This one would make an awesome gift!! The Stove in the Can can also be used for tailgating, hunting, fishing, backyard fun, cookouts...you name it! If you don't have a backyard fire pit this is a great solution! - Heats water, cooks food & keeps you warm in an emergency or recreationally. Provides a campfire-like experience in an self-contained, compact solution. -Indefinite shelf life. Buy it once & use when needed. Great for emergency & 72-hour kits. -Safe, Compact & Durable. Uses a non-explosive, 100% waterproof fuel source. Measures just 6″ wide x 4″ tall. -100% Satisfaction Guaranteed or your money back. See my pictures of us using it here in this post! Check out this video for a quick "How to"
a Rafflecopter giveaway Giveaway will end August 15th at 11:59 pm. Sponsored by Stove in a Can. I received a product for review. No other compensation was received. All opinions are my own. This promotion is in no way sponsored, endorsed or administered by, or associated with, Facebook. We hereby release Facebook of any liability. Winner(s) will be contacted by email and will have 48 hours after the giveaway ends to respond before another winner is picked. I'd keep it for emergency use. I'd use this for my upcoming camping trip to Yosemite! Keep it for emergencies. Seems like we always lose energy when there is a storm. I would probably place it in an emergency kit, or have on hand for camping too. I would use this to heat up food when the power is out! Would be a great addition to my emergency (hurricane) kit, or my Dec camping. I got totally excited when I saw this! It would go straight into my &2 hr to go bag. Love it! This is perfect! Would come in very handy for our camping trip in September! I'd use it for emergencies, power outages, or camping. I would use it for camping and it would be nice to have around for emergencies. Thanks! I would use it when camping. I would use mine for emergencies, when the electricity goes out and for boiling water for safe drinking. We have been having power outtage's due to the storms I would use it for that. updating our kits and this would help! this would be great when our power goes out....which is often! If the electric goes out for awhile then I would use it. Thanks for the chance. I would keep it for emergency use. Our power goes out quite often in the winter months and this would come in handy. I would use this for emergencies. It would be great to have it around just in case. Thanks! I would keep it for emergencies especially for winter. I would love one of these for each one of our emergency kits. We are avid campers! This would be perfect! I'd keep it in my 72 hour kit. I'd keep in my earthquake emergency kit. Thanks for the cool giveaway! Keep it in the car for emergency's. Camping with my friends! We go every weekend! I would keep it for an emergency. I would use it when my propane is low to save money. I'd also use it on my upcoming camping trip. Cool product! I would use it for emergency cooking if we lose electricity this winter. WOULD love this for our family camping trips. What a cool idea. Perfect for an emergency kit for home or the car. I would keep it for emergency situations! We have had numerous power outages over the years, and this would have came in handy! I would put this with my emergency supplies so I'd be ready! This would be a great survival item to have on my hurricane list. We get quite a few storms throughout the year that knock out the electricity so I would use it during those times. For emergencies, you just can't be too prepared!!! TY! I'd use it for emergencies or camping. We live in a very rural area & lose power all the time! I would use it for survival in those times. I go camping at least once a year, so I would save it for that! I'd definitely use it in our emergency Kit. I would use mine during a lunch break when working on an outdoor project in the winter time . I would use mine to keep warm during lunch break when working on an outdoor project in the winter time. It would be great for camping! I love to have things like this, we have lost power several times this year alone due to storms. This would be great to have here we have lost power several times this year alone due to storms. It is a wonderful thing to know you are prepared. I'd put it in the emergency kit. I would use it for cooking and boiling water. Simple! This would go in my 4x4 bag that I take each weekend when I go camping. I already have a couple MRE's in there, but it'd be nice to have something I can cook with. I would put it with the camping stuff. Defiantly for emergency, after I try it out once on our atv rides & cook out. Looks very portable, right in the pack. But we loose power constantly & this would be a great product to have in the "emrgy. great :( power is out again" kit! I'd save it for an emergency to use to cook and keep warm. I would give it to my husband for his yearly backpacking trip. I would test it out while camping, if we really like it I'd get more for emergency. use it for emergencies since we get hurricanes from time to time.